Nikolai Feodorevich Kostrukoff was born in 1898 in the Don Valley region of southern Russia. His military schooling was at the Don Cossack Stanitsa of Tsymliansk. There he also conducted the choir. At the age of 17 he served with a Don Cossack regiment in the first World War and the revolution, at that time holding the rank of lieutenant. After the revolution, as a czarist White Guard Cossack officer, he was forced to flee Russia. In 1927, while studying mining engineering at one of the universities in Prague, Czechoslovakia, he found many of the singers who had previously sung with him when at Tsymliansk. To keep busy during the summer of that year, he called the chorus together hoping, by giving a few concerts, to earn a little money to carry them over to the fall, when the new semester of university would begin. The concerts were an instantaneous and enormous success, and he never returned to university. The president of Czechoslovakia, Thomas Masaryk heard the chorus and, under his patronage, Kostrukoff and his chorus began a career that lasted 45 years, bringing them success, acclaim and fame on all 5 continents and 67 different countries, traveling on 107 different ocean liners, crossing the equator 19 times in places such as the Atlantic, Pacific and Indian Oceans as well as in Sumatra and in the Republic of Ecuador. Earliest known photo of the General Platoff Don Cossack Choir, circa 1915, taken at the Don Cossack Stanitza of Tsymliansk. 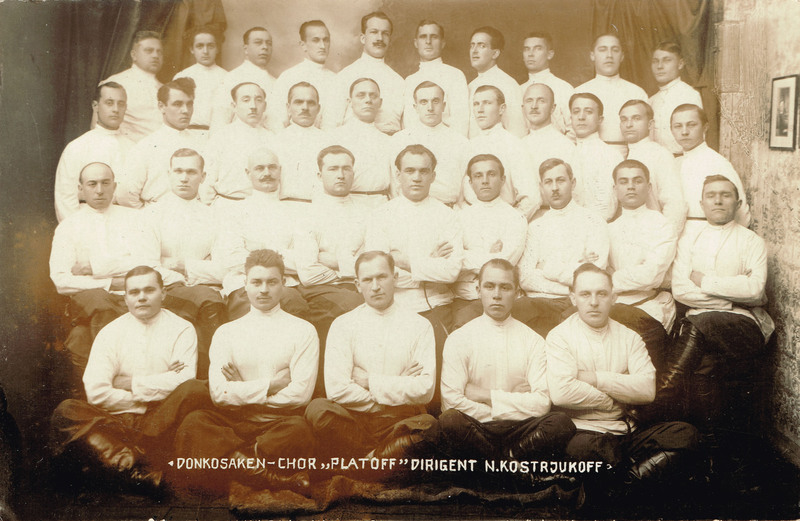 Kostrukoff is seated, second row in the middle. The chorus has given more than 9,000 concerts. Of these, 875 were devoted to the music of the Russian Orthodox Church and were performed at various churches around the world. Among these performances was a concert given at the Cathedral of Notre Dame in Paris, before an audience of more than ten thousand, among whom were the archbishop of Paris, Cardinal Verier and other church dignitaries. The chorus has appeared in the world’s most prestigious concert halls: the Konzert Haus in Vienna, the Colon in Buenos Aires, Carnegie Hall in New York, and the great concert halls of Berlin, Tokyo, Paris and other principle cities around the world. Kostrukoff and the General Platoff Don Cossack Choir in France during the early or mid 1930s. Kostrukoff would like to have served in the Second World War, but his age disqualified him from active service. To help the nation, Kostrukoff offered his services and those of his chorus to aid the war effort. Giving hundreds of concerts for the USO in both the United States and in the far east, Kostrukoff and his chorus sometimes performed two concerts a day. There exists a photo of the chorus in US Army uniforms during one of these USO tours. During the war, the choir also gave almost a hundred concerts for war bond drives and in veteran’s hospitals. President Truman and his family greets N.F. Kostrukoff following a concert at Constitution Hall in Washington DC, 1948. After the war, at the behest of General Douglas MacArthur, the governor general of Japan, the chorus sang in Japan not only for our servicemen stationed there, but also for the Japanese public, who received their concerts with almost fanatical enthusiasm. 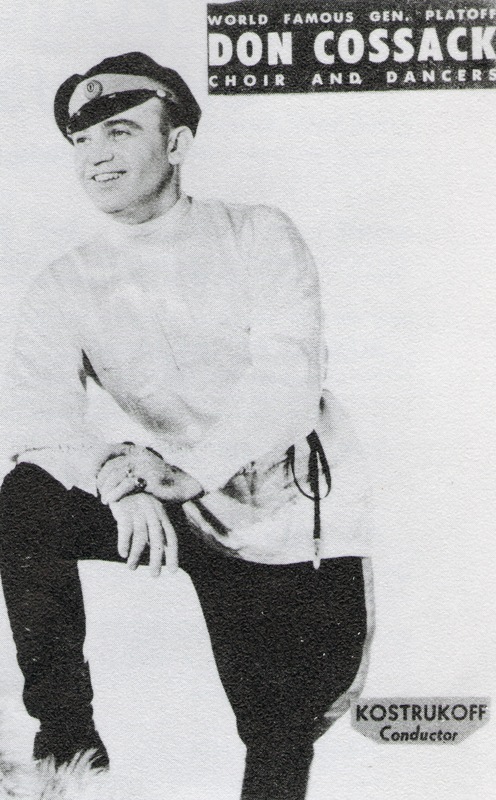 The famous Japanese film director Akira Kurosaua was so impressed with the chorus that in a film, the Japanese version of Dosteovesky’s “The Idiot”, he used a good portion of the chorus’ recording of “Monotonously Ring the Little Bell (Dedovitch tenor solo)”, as background music to convey the melancholy of the Russian countryside. After the tour of Japan, the chorus returned to the states to resume its trans-American and trans-Canadian tours. The choir has appeared in all 50 states and all the provinces of Canada. On February 13, 1955, the chorus appeared on television on Toast of the Town, hosted by Ed Sullivan. In the early 1960s, at the same time as the chorus was on a trans-Canadian tour, the Soviet Red Army Song and Dance Ensemble was also touring Canada. Their tours and concerts kept criss-crossing and leapfrogging over each other. The Soviets would appear in a city, the Cossacks a short time later, then the Cossacks would appear in a city and the Soviets later. When the Kostrukoff Cossacks sang after the Soviets, people would tell him and his chorus that they thought the Cossack chorus of 25 was much more preferred than the Soviet’s 100+ man ensemble. They felt the quality of the singing was much better, the program more diversified and entertaining. This was the time of the Cold War, and the Soviet group was forbidden from performing in the United States. There were Americans who lived closed to the Canadian border who entered Canada to see the Soviets, some for interest in Russian folk music and others out of curiosity. Later, when the Cossacks met these people, their opinion was much the same as the Canadians. As time went on, and Kostrukoff had to replace older singers or those who didn’t wish to tour any longer, his criteria for choosing new singers was threefold: the best talent available, staunch czarist sentiment, and vehement anti-communist feelings. Until ill health caused Kostrukoff to disband the chorus in 1972, they continued to tour the US and Canada, never failing to satisfy and excite the public with the ardor, passion and spontaneity of its singers and the fire and excitement of its dancers. Of the close to 10,000 concerts that Kostrukoff had given, the most important to him were the 59 that he conducted in military and veteran hospitals during and shortly after the Second World War. There is a maxim in the theater: leave your audience asking for more. Kostrukoff followed this maxim explicitly, except for these concerts. Looking out at these crippled, mutilated veterans — some blind, some with amputations, some suffering from severe shell shock, and many in wheelchairs — he felt, from the depth of his being, compassion for them. Remembering 25 years earlier, as a front-line Don Cossack officer in the First World War and Russian Revolution, he knew first-hand what they had experienced. To honor their valor and sacrifices, the concerts would end with encore after encore after encore after encore. These concerts, coupled with the 245 given for the USO in America and the Far East, and the 39 given for the Fifth War Loan Drive, showed Kostrukoff to be a true and patriotic American, and in my opinion a great American. I am confused on the choir’s director. You cite N.F. Kostruckoff as the conductor and other sites cite Jaroff–which is true or are there more than one choir? Also, who is General Platoff? You have a great blog. Any info would be helpful. Thanks. Serge Jaroff was the conductor of another Kossack choir. There were actually several different Cossack choruses, including two different Kuban Cossack choirs, a Ural Cossack Choir, and a Black Sea Cossack Choir. Kostruckoff was the conductor of the “General Platoff Don Cossack Chorus”, whereas Jaroff was the conductor of the “Don Cossack Chorus”; these were two separate groups. General Platoff was the leading Cossack general who helped drive Napoleon out of Moscow during the Napoleonic Wars. For this service, he was made a Count. Kostruckoff used the name of General Platoff in his chorus to honor the memory and accomplishments off General Platoff. Здравсвуйте. Мой отец-Рево Александр Нилович. Год рождения 1936. На Вашем сайте по фото и фамилии я узнал, что мой дед выступал в этом хоре. Это Нил Рево. Хотелось бы узнать больше информации о нем. Как это можно сделать? Jaroff’s website displays a list of all the singers that performed with him. These names do not appear there, so we must assume that they sang with Kostruckoff’s choir if they sang with a Don Cossack choir in the United States. Do you have any other information about them, i.e., where they sang or lived? I do not know the names, and if you have any other information about them, please let me know so I can add it.